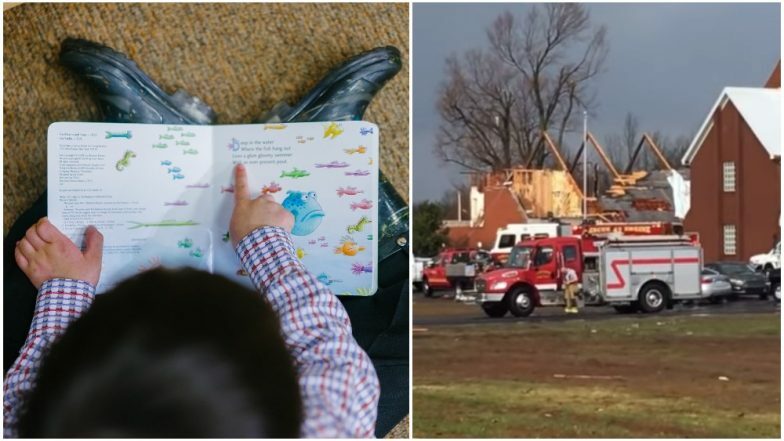 A group of pre-schoolers in Paducah, Kentucky were saved miraculously from a disastrous tornado that passed through the region. It damaged the Mount Zion Baptist Church and Day Care but the children and teacher were left unhurt. The disaster ripped off the roof of the church, however, 40 preschoolers and 10 church staff members were not injured. Following the incident, the church officials said that God saved them. According to The Christian Broadcasting Network, the preschoolers sang 'Jesus Loves Me' and 'He's Got the Whole World in His Hands' as a tornado ripped through the area bringing down electrical posts and destroying houses. Kentucky State Police stated that about five square miles were damaged, including the church preschool on Blandville Road. Bibles And Cross Remain Intact in Fire That Engulfed West Virginia Church, Fire Department Shares Pictures. Following the incident, Sheriff Carter reportedly said, "The Almighty hand of God has provided safety to our community. The destruction path is approximately five miles long. There is approximately three homes that are devastated but no injuries, and also there are approximately a half-dozen other homes that have sustained minor to moderate damage. This could have been an extremely high fatality rate, and we're very fortunate and blessed to the only report that one minor injury." Carter said the tornado first touched down just west of Gholson Road and travelled northeast to around Denberry Lane. It affected Stevin Drive and travelled southeast of McCracken County High School. Church member Sylvia Cherry said, "We just give God the glory that no one was hurt." Michelle Rushing, director of the Mount Zion Baptist Day Care, said staff moved children and workers to a safe room after receiving a tornado warning. Following the storm, staff and students found out the nursery and the sanctuary had been destroyed. But the room the children and teachers took refugee remained untouched. Rushing said that God had helped keep everyone safe in the building. They are planning to rebuild the church soon. The ripped took away electrical connections of more than 5,300 residents. The public was asked to avoid the area as downed trees, debris and broken electrical poles were being repaired.